Eric's loose painterly style will also bring eleven other moments from Westeros to life for your viewing pleasure. Oh wow I need this, like I need air. Would that happen to be a Greyjoy in the first painting? directly under the image, "And Victorian here is just the beginning!" Typo FYI, it should be spelled Victarion vs. Victorian in the article and in the first caption. I presume the second image is not from the calendar, but unrelated art by Mr. Velhagen inserted in the post as another sample of his work. Is that so? It's been a while since I've read the books (I'll restart my reread when the next book is officially scheduled for release), but I thought the Greyjoys shun armor? Don't they consider it impractical for shipboard fighting, and a sign of weakness on the part of their enemies? Not at all. Just the reverse. They come from the IRON Islands, remember? A little curiosity: did the ironborn name themselves as such even prior to the knowledge of how to properly work the material? They learned it with the arrival of of the Andals, but their name came before because of the abundance of iron ore in the islands (and the "hardness" of it)? I stand happily corrected. Perhaps I confused this with a similar concept in some other fantasy book. But it makes sense - the Ironborn aren't afraid of drowning. I think most cultures, both historical and fictional, shun armour when taking to the sea to fight. It's more common sense than anything else, but the Greyjoys... are a bit different. There is a specific mention of Iron Born wearing armor on board ship and their disdain for those to afraid to do so. (Medieval men at arms seem to have worn full harness during sea battles such as Sluys (1340)). Because of costuming in the earlier seasons of GOT some got the impression that it was set in the Dark Ages (one unsullied friend thought it was post-apoc). I at least I hope this is right since I have painted a large Iron Born army for gaming and they are in mail with leader types in at least some plate (not quite as extensive as that here depicted but that's the great thing about book based art - there's room to interpret). Not wishing to have to repaint the lot in just braes. Have every calender so far and looking forward to this one. Note that there are at least 4 dragons visible in that picture, so it isn't going to be anyone in the main series. It's implied that the white-gold hair of the Targaryens was typical of all Valyrians as well, and add in that most dragons seem to have had at least some color to their scales and/or wings, and I have to assume that one is not actually an ASOIAF painting. The first one in this post is labelled as ASOIAF; the other is just one of Velhagen's paintings, so -- some other fantasy setting, presumably. Mr. Martin, I'm curious as to whether there's a particular moment or scene in ASOIAF (Or Dunk & Egg for that matter) that hasn't yet been illustraded or even filmed that you'd be particularly interested in seeing? Personally, I think Young Griff's speach to the Golden Company commanders could be pretty cool. In Ghiscari language, what is the meaning and difference between "zo", "mo" and "na", for example in Hizdahr zo Loraq, Skahaz mo Kandaq and Prendahl na Gezn? How difficult is he on a scale of 1-10 to write George? I know you always reference Bran as the most challenging to write because you have to in essence inhabit the skin of a boy. Victarian seems like he would be a blast to write and a far easier POV character to embody. You just need to imagine yourself as an insecure brute who lacks a sense of humor. P.S. It has been a few months since you referenced the progress of TWOW. Do you know for a certainty if the series is still going to be 7 novels as planned? Gotta have it, like every year ! I know Winds has put a pretty significant hold on all other writing projects, but any chance for a new Dunk and Egg installment in the next couple years? Or does that kind of slip through the cracks and get picked up only sporadically? Love these calendars, George and I can't wait to pick up the new one. Will the 2018 edition have any scenes from WINDS? The 2016 calendar had an image from the Mercy sample. I wondered if there were plans to include any artwork from WINDS in the 2018 calendar? This looks pretty amazing, George!! But one question, is this chalendar scheduled to arrive to south america? Or is it only for english speaking countries? Thank you! We sometimes sell translation rights. It's a country by country, language by language thing. Okay, I know this is waaaaaay too far-fetched but this almost seems like that two of my favorite things ever (ASoIaF and RuPaul's Drag Race) have merged in this quote, lol. I loved the artwork btw, I can't wait to see how the whole calendar will look like. (And obviously I can't wait for TWoW). Is that the Red Woman on Dragonstone? I like the Victarion artwork, he is one of my favorite characters in the lasts books! 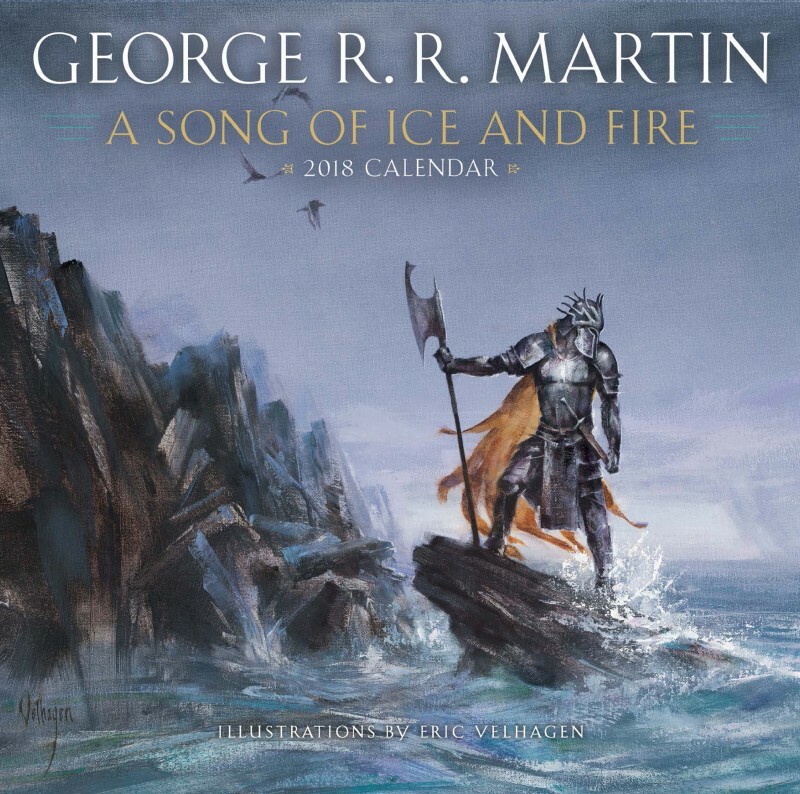 I've owned all of the ASOIAF calendars and can't wait to purchase this one. The artwork in them has always been stunning. How are the artists chosen? I pick artists I like. (Of course, some are not available. But I like a lot of artists, so there is always another choice).